I tend to be a traditionalist for most things, but don't go out of my way to make trouble for other people who don't appreciate the way things are and have been... as long as, per Thomas Jefferson, "It neither picks my pocket nor breaks my leg." In other words, if your actions cause me no financial or physical harm, I'm not likely to oppose your actions - unless they're illegal. Many older Hams are greatly offended at the Federal Communications Commission (FCC) for having removed the Morse code requirement in 2005 for obtaining an amateur radio operator's license. They see it as a way to separate the wheat from the chaff, so to speak; that is to say, to maintain a barrier that keeps non-serious aspirants from gaining entry into the ranks of the elite group of communications hobbyist who have the mental fortitude to master code. Others see it as a way to prevent overcrowding of increasingly scarce available bandwidth. To be fair, though, many believe that possessing a minimum level proficiency in the sending and receiving of Morse Code is essential to perpetuating not just the original spirit of the hobby, but to have at one's disposal an ability to communicate with the barest essentials of wireless: on-off keying of a signal. Anyway, you can see by this 1935 article that the debate has endured nearly as long as amateur radio itself. 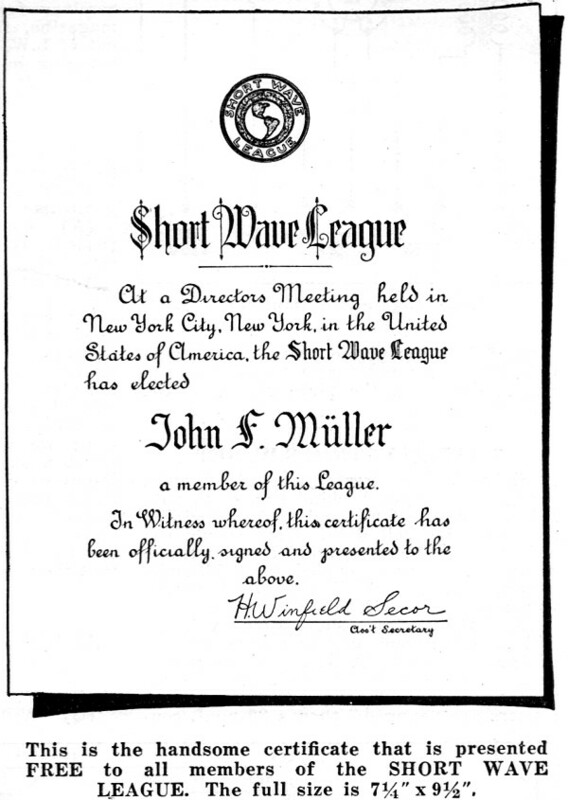 This is the handsome certificate that is presented free to all members of the Short Wave League. The full size is 7 1/4" x 9 1/2". In regard to the No Code Test for a license below 6 meter phone or any phone "rigs," I find it is all "baloney' 'anyway. I have never heard of such selfishness from persons professing loyalty to the art of Radio Amateurs, by opposing such a thing when it could not possibly harm anyone on account of the short distance you are able to work on 5 meters. Most of those opposing the No Code below 6 Meters have no intention of working below 10 meters, anyway. I was one of those who signed the first petition to have our Government control the Amateurs, on account of the terrible QRM (interference) some were causing by putting 5 kw. (5,000 watts) on the air for "playing" purposes only, rather than "getting down to business." At that time there was no intention on the part of those signing the petition that there should be any examination of any kind. The main purpose was to stop any unnecessary interference. Certain parties who would like to get rid of the Hams, have pulled strings with those who have been put in charge by the President. They, not knowing anything about wireless, were easily convinced that the Hams should pass an examination, so the examination for the Hams each year is being made harder. If you Hams cannot read the "handwriting on the wall" you better quit squabbling or it won't be long before there won't be any more Hams. 6232 S. Alamo Blvd., Bell, Calif.
Why a Code Test? Says This "Amateur Operator"
As a reader of the Short Wave Craft magazine and also an amateur radio operator, believe that any short-wave or radio "fan" that desires to become an amateur radio broadcaster on the phone band of only five or ten meters, should not be forced to pass a code test for the reason that he does not want or care to use code. I know what a stumbling block it was for me to pass a code test of only ten words per minute. I don't mind any theoretical questions on radio but when it comes to the code part, I feel tuff. Hi, Hi. Hershel Talbot Walton, 711 Wyoming Avenue, East Liverpool, Ohio. I sincerely believe, and and so do many others, that all this argumentation on this "codeless phone license" below 6 meters is entirely foolish. Why should anyone with a phone transmitter clutter up a useful and already crowded band? Why shouldn't they pass a slow code exam. and thus be eligible? Why, there's nothing to learning code, once you set your mind upon it. And also, I believe that the exam should be kept very stiff to prevent "hobbyists" from crowding this band. And how could the fellows who are actually trying to do something with radio do anything, when there are a lot of fellows that have been "thrown together" and chewing the rag with their friends and causing a lot of unnecessary QRM? Such Hams as these should and must be kept off the air! Radio isn't a plaything. It's a very serious and grave business for fellows who are sincere in their ambitions. I am not a Ham yet, but I know my code throughout; plus of course the "Q" signals. By this summer I expect to pass the exam and have my own code transmitter. Alvin C. Sieger, 73 Elwood Street, New York City. 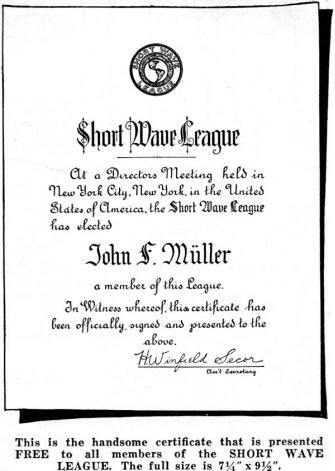 I have read all the letters in the Short Wave League page for the past few months and the best to date was Mr. Worcester's. I do not think the mathematical part was very important, but the few pertinent facts he stated were. The mathematical part was pure theory (to which I adhere closely) and is merely meeting extremes. When in letter No.1 J. B. F. asks as to the whereabouts of broadcasting, if it were not for the help of amateur radio-telephony, I counter: Where would radio-telephony be if code transmission were not developed first. J. B. F. should remember that we first had to progress in voice transmis­sion, before we even thought of television. Approaching letter No.2 which remarks about "selfish" Hams, I will refer J. O. R. to Radio-Craft for the month of June, wherein the author of the article on page 725 states that if a person has enough interest and sufficient determination to master a 20 W. P. M. speed in code, he will undoubtedly be a success in his particular radio undertaking. "A good radioman should know every sound coming from a horn or pair of receivers." The above statement is unquestionably one of the best arguments ever published. I do not like H. R. C.'s appellation of "gas-bag artists." Even without code test, if a man can get a good radio telephone set on the air he is to be commended for his efforts. 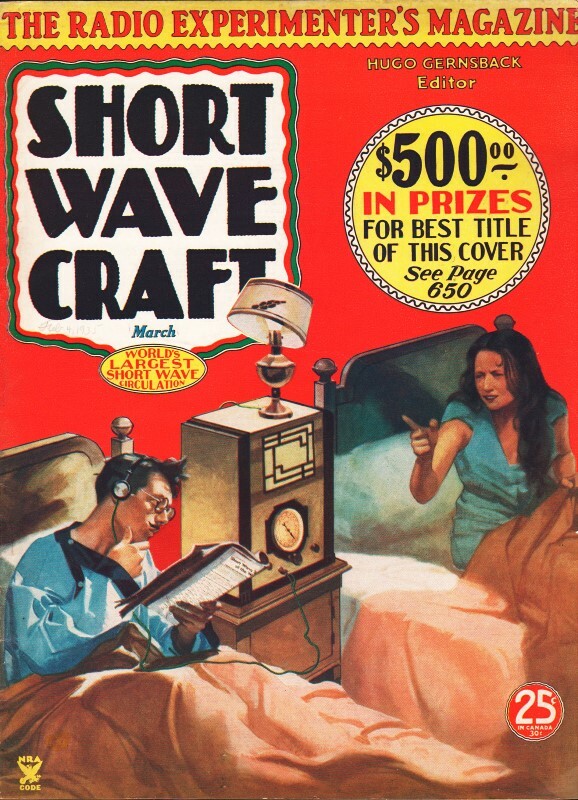 Now I will backspace and refer to your editorial in the June issue of Short Wave Craft. The part of it which remarks about the drowning out of signals also recalls the fact that interference and static generators will be used by enemy operators to prevent the hearing of signals legibly. It is a well-known fact that code can pierce interference and static more easily than can voice. Any good operator can understand the gist of a message by just receiving pieces of it. A little noise will make any voice conversation entirely unintelligible. My last argument is one which probably has no place here, but I am giving it anyhow. I still think sentiment has plenty to do with the development of amateur radio. It is for this reason that I think the "old-timers" in radio will not let code "die." It is for this reason (sentiment) that the old "Hams" regard the no-code advocates as "jelly-fish and sissies." If I may make a prophesy: Code will still be as much a vital issue in radio for the next ten years as it is now, and it will never die out entirely ! Joseph Alinksy, Jr., 104 Schuylkill Ave., Shenandoah, Penna.